A 51-year-old woman was fatally injured after being hit by a commercial semi-truck when she reportedly ran into traffic on the Interstate-5 yesterday, the Oregon State Police have reported. According to investigators who are still looking into this fatal truck accident, the woman, who was from Roseburg, had ran into traffic just on the I-5 near Sutherlin after about 4 p.m., attempting to run from the shoulder of the southbound lanes to the median. Investigators have not disclosed what may have prompted the woman to run into traffic. 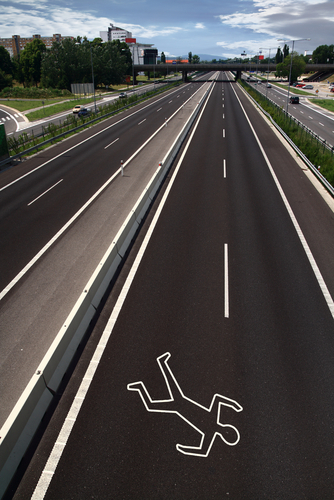 A pedestrian who ran into traffic was recently killed in a fatal truck accident. As the investigation continues, negligence may ultimately be found to have contributed to this accident. Before making it to the median, the woman was hit by a commercial truck, the driver of which had attempted to veer out of the way. The woman ended up being hit by the truck’s rear wheels and, consequently, sustained fatal injuries that caused her to be pronounced dead at the scene of the accident. Could Negligence Have Been Involved in this Fatal Truck Accident? Investigators have not disclosed much more than the above-described details and are still investigating whether any negligence may have been involved in this fatal truck accident. Because the victim in this incident reportedly ran into traffic, it’s likely that she was, herself, at least partially to blame for the accident (as tragic as that may be). Brake failure or other vehicle equipment failure, which could put a manufacturer in the hot seat if the victim’s family decides to file a wrongful death lawsuit in the future. As the investigation into this fatal truck accident is ongoing, it remains to be seen whether any of these forms of negligence may ultimately be found to have contributed to the woman’s death. Have you or a loved one been injured in a truck accident? If so, the Portland truck accidentattorneys at the Savage Law Firm are ready to fight for your rights to compensation and justice. Since 1977, we have been dedicated to providing each of our clients with personal attention, respect and the highest quality legal services in order to help them obtain the compensation they need and deserve. Helping you recover from the financial setbacks caused by traffic accidents and personal injuries is one of our primary goals. Our Portland truck accident attorneys encourage you to learn more about your rights and case by setting up a free initial consult.